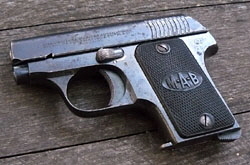 The Type I MAB Model A, in one form or another, was produced from sometime before World War I until 1924. The gun is essentially a 6.35mm Eibar-type pistol of the sort which were manufactured in large quantities in the Basque region of Northern Spain and Southern France in the first three decades of the 20th century. Most, including the MAB, had the manual safety moved forward of the grip, and the grip safety eliminated to simplify production. This final inscription states specifically that the gun is made in France, but of course the previous inscriptions said Bayonne, so that really proves nothing. Quite possibly they were all made in Eibar, as asserted by Bastié & Casanova. Huon, in his book Les Pistolets Automatiques Francais: 1890-1990, states that the MAB Type I Model A is based on the 1906 FN Browning but, while it is true that the early MAB is externally similar to the 1906 Browning and about the same size, it has an internal hammer and so is more like the 1903 Colt. The Type I Model A features a rotating manual safety above the trigger. The safety does not lock the slide when engaged. However if the safety is engaged when the slide is retracted it will lock the slide open in the correct position for takedown. The gun features a captive recoil spring, and some variants also have a magazine safety. We do not know whether the magazine safety was a late innovation, or if it was in the early models and was later eliminated--we do know that serial numbers 327 and 511 have the magazine safety. (Please contact us if you have a Type I and let us know your serial number and whether or not your gun has the magazine safety.) There is no grip safety. The slide has ten curved serrations at the rear. The grip plates are of checkered horn, with an oval-shaped M-A-B monogram in the center. The letters “MAB” are also stamped in an oval on the left side of the grip tang. The serial number is stamped on the grip frame on left side beneath the grip plate. The Model A has a fixed barrel with the recoil spring located beneath it. There is a sighting groove on top of the slide. Huon gives the length of the gun as 113mm, and the length of the barrel as 54mm. It weighs 350 grams (12.4 ounces), and holds six rounds in the magazine. These early Model A guns are quite scarce. Probably less than 10,000 were made. I should point out that the gun was not known as the Model A at the time of its introduction. It was simply the “Pistolet Automatique MAB.” The model designation did not become necessary until later. And it may be that this early pistol was never referred to as the Model A by anyone involved with MAB. Production of the Type II Model A with a blued finish began in January of 1925. A nickel-finish version appeared in November of 1929. The Type II was a striker-fired, single-action 6.35mm pistol, with a six-round magazine capacity, that was clearly based on the 1906 Browning. The addition of a grip safety on the Type II set the M.A.B. Model A apart from the other cheap 6.35mm Browning copies. 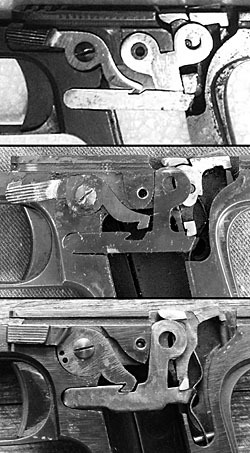 The Type II also has a second notch on the left side of the slide, which allows the manual safety latch to hold the slide open at the correct position for disassembly (a feature the 1908 Colt lacked, but which was included on the later variants of the 1906 FN Browning). 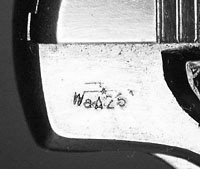 The serial number is located on the right side of the frame, just above the trigger. The first serial number for a Type II was 10001. According to Huon (and Josserand) production of the Model A ceased in September of 1964. In Pistols of the World Hogg & Walter state that manufacture ended in 1985, but we find little evidence to support this. It is clear that the design of the MAB Model A evolved over time. We have distinguished at least three distinct variants, though there may be more. Additionally, until we examine more guns we cannot be certain that all changes in the variants illustrated were applied at once. Changes may have been incremental, and there may be guns with features intermediate between those of the variants shown here. 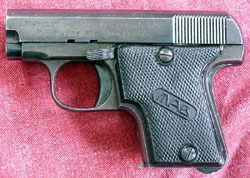 The first variant, like the Spanish Eibar pistols, shows some simplification of the original Browning design, such as the elimination of the stirrup-shaped connector bar between the trigger and the sear, which ran on both sides of the magazine well. Along with the grip safety, this was probably the first thing to go in the early Spanish copies, because it was too complicated and time-consuming to manufacture. The stirrup was replaced by a simple steel bar between the trigger and the sear that ran on one side of the frame. Browning’s disconnector was a projection from the top of the stirrup-shaped connector, which was pressed down by the recoiling slide, disconnecting the connector and sear. This design was replaced on most Spanish Eibar pistiols by a vertical bar of metal that was pushed down by the slide as it recoiled to the rear--it depressed the connector bar so it could not engage the sear again until the slide returned to its forward position. But the Type II MAB Model A diverged from the Eibar pistols. The early MAB disconnector features two round lobes on top, reminiscent of cartoon mouse ears. The forward lobe pivots on a round axle milled into the frame, while the rear lobe is depressed by the slide as it recoils, disengaging the connector bar. We have examined a lot of automatic pistols, but this design is unique in our experience. The manual safety lever on the first variant Type II is flat, and fits into a recess milled into the frame, such that there is just room for the safety to move up or down a millimeter or two. On the back side of the lever is a recessed ball bearing that mates with two depressions in the frame to provide click stops for the On and Off positions of the safety. The lower portion of the frame recess serves as a positive stop for the safety in the Off position. Another unique feature on the first variant of the Type II Model A is the design of the firing pin spring guide, which has a small pin projecting at a right angle from its rear section. This pin locks into a recess in the top of the slide and prevents the striker and spring from flying out when the slide is removed from the frame. The rear section of the guide has a slot in back, which can be used to turn it into position with a small screwdriver. The slot is vertical when the spring guide is locked in place, and is held in this position by a vertical bar of metal in front of the backstop for the firing pin spring, so the guide cannot be turned out of its locked position while the slide is on the frame. The upper portion of the grip safety lever is the width of the inner compartment of the frame. Like the Browning, the grip safety on the Model A securely blocks the sear, making the gun safe to carry with a round in the chamber. The Model A features a magazine safety. A spring-loaded L-shaped lever is placed between the back of the magazine and the front of the sear. When the magazine is withdrawn this lever springs forward and out of contact with the sear. The magazine, when inserted, presses the lever back to provide a fulcrum that allows the motion of the trigger and connector bar to rotate the sear downward to release the striker. Magazines for the early variant had five staggered holes drilled in each side to allow the cartridges to be visible. The base was pinned to the magazine body. 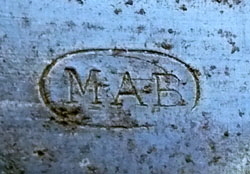 Some had the letters “MAB” stamped in an oval on the side of the magazine, and some had “MAB” stamped on the base. We have been unable to determine which is the earlier configuration. The grips are of checkered horn, and are perfectly flat on the back. They have a wide smooth border, and feature the serif letters “ M•A•B” with dots between them in an elongated oval. The word “breveté” means “patentee,” or as an adjective “patented or certificated.” In the context here, it means that the pistol is patented. We believe that within a few years--probably sometime in 1928--the internals of the Model A were significantly redesigned to create the second variant of the Type II Model A. The second variant features a number of simplifications designed to speed manufacture. The shape of the lower projection of the sear that engages the connector bar was modified slightly. The connector bar and disconnector became a single unit, the pivoting front lobe of the disconnector being eliminated. The milled portion of the frame beneath the manual safety latch was reduced so that most of its area was covered by the grip plate. The latch itself was modified so that it was no longer flat, but the portion grasped by the thumb bent up slightly out of the milled area to clear the surface of the frame. The pin that held the firing pin spring guide in place was eliminated. The vertical bar on the firing pin spring backstop was eliminated and the backstop was slightly enlarged, with an inset to fit the back of the firing pin spring guide. The trigger was reduced in size so it did not protrude as far into the trigger guard. We believe it likely that the grip monogram was also changed at this time. The characters became more stylized and the dots between the letters were eliminated. The “MAB” stamped on the left side of the slide also used the stylized sans-serif characters. The grip plates had a more narrow smooth area surrounding the checkering, and the back of the plates remained flat. We are not entirely certain what the grip plates were made from during this period, though many of them are known for disintegrating easily. Some Model A pistols, likely from the 1930s-1940s, have “MAB” stamped on the right side of the frame above the bow of the trigger guard. Some guns from this same era also have “PT” stamped on the right side of the slide, just below the ejection port. This is a smokeless powder proof mark. German forces occupied Bayonne during World War II from the summer of 1940 through late 1944. The Germans took over the MAB factory and continued production of Model A, C and D pistols. It may be that the Germans simply assembled the Model A parts that had already been made when they took over, but we have no firm knowledge of this. The 6.35mm Model A could hardly be considered a compelling military weapon, but it would make sense for them to assemble any parts already on hand. According to Huon, the serial number sequences from pre-occupation guns were continued by the Germans. According to a factory letter dated March 1967, a total of 1130 Model A pistols were manufactured during the occupation, with serial numbers in the range from 107900 to 109240. Pistols produced during the occupation received a Waffenamt acceptance stamp on the grip tang on the right side of the frame. By June of 1945 the MAB factory was back in production under French control. A return to sales and profitability was essential. It was necessary to get people back to work, as well as to reduce costs and streamline production. Significant redesigns of most of MAB’s guns were undertaken after the war, with immediate attention given to the Models C and D. The Model A’s turn probably did not come until around 1948, when the third variant was introduced. According to information provided by the director of MAB in 1958, the Model A extractor was stamped from sheet steel, rather than milled from stock, beginning on 30 May 1948. Since Huon states that the Germans continued the serial number sequences previously established by the French, and we know that the first serial number for a Model A with a stamped extractor was 65001, we presume that the Model A serial number sequence was restarted at this time. According to Huon, the trigger was also stamped, instead of milled. Probably in 1956 the triggers were enlarged to their original size and were again milled from stock, with ridges milled in the front surface. The connector bar was reinforced. The upper left side of the sear was cut away, the lower portion was reduced in size , and the lower projection that engages the connector was changed in shape again. The firing pin spring backstop was lengthened and reinforced. The sear and magazine safety were redesigned, as was the grip safety lever. The manual safety lever was given a square-cut gripping surface. The round portion of the manual safety lever was enlarged slightly, and in the enlarged area two holes were drilled, beneath which a plunger and spring were installed to provide click stops for the On and Off position of the safety. Beneath the grips, the cutout portion of the frame behind the magazine was enlarged downward, probably to aid in assembly. The grip safety design was altered so that the upper end narrowed to a point--this change was necessitated by the redesign of the sear and magazine safety. It may not have come immediately after the war, but at some point the third variant grip plates were made of molded plastic with a rectangular inset on the underside. These plastic grip plates are well known for shrinking over time and cracking at the screw holes. Late Model A magazines have a slot on the left side to view the cartridges. We do not know exactly when this change was made. The magazine base on the later pistols is no longer pinned. February 1954 issue of American Rifleman. 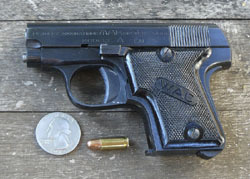 After the war, MAB pistols were imported into the United States by the Western Arms Corporation, and later were sold by its distributor, the Winfield Arms Corporation. Some were simply marked MADE IN FRANCE on the right side of the slide, but fairly early this was changed to MADE IN FRANCE FOR W.A.C. 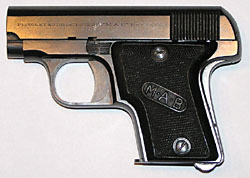 At some point (possibly as early as 1949) a WAC monogram was substituted for MAB on the grips. The WAC monogram was in sans-serif characters, but was not stylized like the MAB monogram. PISTOLET AUTOMATIQUE MAB BREVETE - S.G.D.G. The abbreviation “S.G.D.G.” stands for “sans garantie du gouvernement”--without government guarantee. The serial number sequence for Model A pistols was probably restarted again in 1955 at 2000001. We are not aware of any Model A pistols made after the war with serial numbers in the 100000-200000 range. Dating MAB Model A pistols is problematic, but we do have a few key dates to use as reference points. We welcome further information from other collectors. If you wish to help, please send detailed photographs of your Model A, including the serial number, the left side with the grip plate removed, and any information you may have as to the provenance and age of your gun. In 1909, only three years after the introduction of the first 6.35mm (.25 caliber) pistol by Fabrique Nationale, the Austro-Hungarian empire passed a law banning the sale of any gun with an overall length less than 18 centimeters unless the purchaser obtained special permission from the government. After World War I, when the Austro-Hungarian empire was dismantled, Czechoslovakia retained the law. A number of arms manufacturers got around this prohibition by simply offering longer barrels for their smallest pistols. These included Clement, Fabrique Nationale, Steyr, MAB, and several Spanish manufacturers whose pistols were distributed in Czechoslovakia. 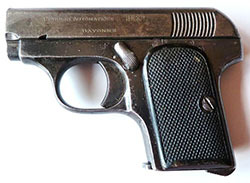 The New Model Melior, manufactured by the Belgian firm Robar and Co., was available with a long barrel, as were the Czech Slavia, Mars, and DUO pistols. All of these long-barreled guns are collector items today. Make sure the magazine is empty and there is no round in the chamber. Draw the slide back to the takedown detente on the left side and lock it open with the manual safety latch. Rotate the barrel clockwise (as you face the front of the gun) approximately one-third turn. Disengage the safety lever and draw the slide, barrel, and recoil spring off the frame. Les Pistolets MAB, by Jean-Pierre Bastié & Daniel Casanova. Crépin-Leblond et Cie: 2015. “Those Lo-o-ong Barrel 25s,” by James B. Stewart. Gun Collector’s Digest, 1974. I am indebted to Bill Kelsey for sharing information on the development of the Model A, as well as for photographs. gentlemen for their ongoing support and criticism. Any errors are mine alone. Copyright 2010-2015 by Ed Buffaloe. All rights reserved. Click most photographs to open a larger version in a new window.